Valerie Purvis: Do you mind very much, Mr. Shane, taking off your hat in the presence of a lady with a gun? Not even Bette Davis could save a lousy script. Dashiell Hammett's The Maltese Falcon might seem a surefire property, as its first version in 1931 (sometimes called Dangerous Female) and the canonical 1941 John Huston movie testify. But Satan Met A Lady misfires badly. The problem with the script isn't so much that it's mediocre as that it's misconceived. The thinking behind it stays fairly transparent, however: The Thin Man, based on another Hammett novel, proved a big hit over at MGM. Warner Brothers hoped to work the same magic by subjecting Falcon to a blithe, tongue-in-cheek treatment. It didn't take. The cosmetic changes applied to disguise the original story remain, at least to movie buffs, faintly amusing. Private eyes Spade and Archer become Shayne and Ames, while the falcon becomes a medieval ram's horn supposedly stuffed with gems that turn out to be sand. Involved in its pursuit are Warren Williams as Shayne, less the debonair lady-killer he presumably aimed for than a foolish old roué, and Davis as the femme fatale. The trio of mercenary cutthroats, on their own broad terms, surprisingly remains the most memorable aspect of the movie. The Joel Cairo character becomes Prince-Charles-lookalike Arthur Treacher (whose career would later encompass playing second banana to Merv Griffin and selling his name to a string of fish-n'-chips franchises). The gunsel is pudgy and petulant Maynard Holmes, who went uncredited in just about every film he ever appeared in, including this one. Best of all is crusty Alison Skipworth, pinch-hitting as the Fat Man. And as Williams' dumb-blonde secretary Murgatroyd, Marie Wilson starts out irksome but ends up winsome. But the racy comedy that was piled on falls flat (particularly as projected by Williams and Davis); there was enough irony in Hammett's prose to begin with, and it emerges in the two filmings of the book made five years earlier and five years later. This version even dispenses with the indispensable locale, for The Maltese Falcon was, and is, the quintessential San Francisco story. 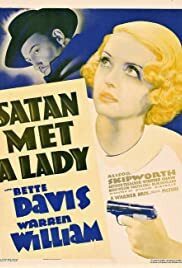 As a vehicle for Hammett's imagination, the best thing that can be said about Satan Met A Lady is that it's slightly more respectable than the 1979 made-for-television abomination The Dain Curse.